Tagged with accommodation, American Homestay Network, Australian Homestay Network, Campus Living Villages, Canadian Pension Plan Investment Board, Global Student Accommodation, GSA, Homestay.com, HotelsCombined, Housing Anywhere, Liberty Living, Student.com, StudentMarketing, The Student Hotel, uniplaces, Unite Students, Urbanest. "Governments, universities and private organisations have recognised that now is the time to push student accommodation to the next level"
And that succinctly underlines the reason for the exploding array of housing operators and options for the modern international student. It is also one reason for the magnetising appeal of the Netherlands-based Class of 2020: a “think-tank” and platform for student housing interests in Europe, it has seen its partners rise from just nine, five years ago, to around 50 partners in 2016. Onclin, its foundation manager, explains that with rising international student numbers in many countries, and sizeable funds considering student accommodation a safe long-term investment, universities themselves have also increasingly realised that to really compete, they need a complete offer of education-and-accommodation to attract the globally mobile. Investment into on-campus housing provision has also led to offsite “private, purpose-built student accommodation” cropping up alongside, and major developers are now moving in on continental Europe, says Onclin. According to StudentMarketing, which has researched the marketplace, in the 30 most popular student cities alone, there are 2,569 student residences with 424,069 beds. Canadian Pension Plan Investment Board (CCPIB) acquired the UK’s Liberty Living portfolio (40 residences in 17 towns) in 2015 and it is a suite of Australian pension funds that backs Campus Living Villages. In April 2016, CLV appointed UBS to help raise further capital for its expansion plans. According to press reports in Australia, Singaporean and Hong Kong-based funds have already expressed an interest in such an investment, which will enable them to cash in on rising numbers of Asian students in Australia. 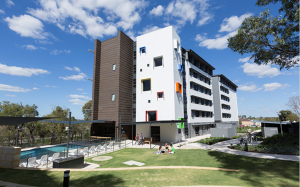 While ensuring uniform high standards for students can be a challenge for all large-scale purpose-built student accommodation firms, there can be benefits, too, for the student in choosing a global operator, says Bobbi Hartstone, strategic partnerships manager at Global Student Accommodation group. GSA’s history includes investment into Unite and Urbanest. Now, the group aims to be the global leader in student accommodation, with over 250,000 beds under management by 2025. Another way to engage with the local community, of course, is through homestay – living with a host family while overseas. While often favoured by language students keen to practise their new language skills, this is another realm of the student housing spectrum which is developing and growing, say stakeholders. David Bycroft, homestay business manager, is running both the Australian Homestay Network and the American Homestay Network. He says the marketplace has been “shaken up” by the growth of groups who are committed to best practice in homestay. “We are expecting in the future fewer but bigger homestay organisation as the industry consolidates and forces out bad operators,” he says. But while some full-spectrum providers report a trend tipping towards independent living and residences, Alan Clarke, CEO of Ireland-based Homestay.com, says the homestay market is actually opening up to a wider market than just language or tertiary-level students. “We are approaching half a million nights booked, so that is half of what Airbnb did in its first three years,” says Clarke, of the three-year-old company. He adds that 40% of the guests who book via the Homestay platform indicate that the reason for travel is education. “There is absolutely a process of educating the market [about homestay] but at the same time, there is a process of the consumer and the market demonstrating a demand for this kind of product,” he says about living with a host, rather than living in a vacant flat of a host in the Airbnb model. Airbnb might have helped – “I think it has put on the table the option of an alternative accommodation choice” – but so too, says Clarke, have two macro travel trends: the solo traveller seeking experiential travel and the unbundling of product purchases. Homestay.com is just one of a new breed of booking websites that are revolutionising the student accommodation scene. Uniplaces is another company, based out of Lisbon, which allows landlords to list their accommodation offer centrally on one portal for students. It was set up by two international students and one British student who met in the UK. With $24m in funding raised, Uniplaces has big plans to unite some of the smaller landlords in one booking system and it employs student photographers in the nine European countries where it is currently active to photograph each room. According to press reports, Uniplaces has already generated over $25m in bookings for landlords since its launch in 2012. The newest name on the block is Student.com, which began life as Overseas Student Living in 2011 but rebranded in 2015. With its own impressive investment rounds raising over $60m, Student.com is a rapidly-growing web portal listing a wide range of mainly residential accommodation in 426 cities around the world. It has an ambitious growth trajectory and has already reached a significant size: it processed over $110m in bookings from students in over 100 countries last year. Co-founders Luke Nolan – who started the business in China after discovering a demand among his network of friends for an easy solution to living abroad – and Shakil Khan, an early investor in music streaming service Spotify, believe the opportunity to reach the growing, independent, “digital native” student base using technology is wide open. Another mover and shaker in the booking space is Housing Anywhere, a student-led platform focusing on short-term accommodation swaps, essentially, between international students keen to spend a semester or year overseas – allowing them to travel without giving up their rental contract in their main country of study. Interestingly, the site has flourished in part because students might find themselves renting with a “big housing operator on a very fixed term”, says Niels van Deuren, the founder, but they are keen to sub-let their room, which they can do themselves via the Housing Anywhere website. For the student, the opportunities are evolving and expanding, with a wider range of accommodation options being presented to them and with booking processes and connectivity made easier. At GSA, Hartstone is confident there will be a lot more evolution to come. “From Prague to Muscat, New York to Moscow, governments, universities and private organisations have recognised that now is the time to push student accommodation to the next level,” she says. This is an abridged version of an article which first appeared in issue #10 of The PIE Review, our quarterly magazine. It helps me so much!